This is one of two poles with the same name located at Sitka National Historical Park. They are similar but both portray the heraldic emblems of the Yaadaas clan from Old Kasaan on Prince of Wales Island. 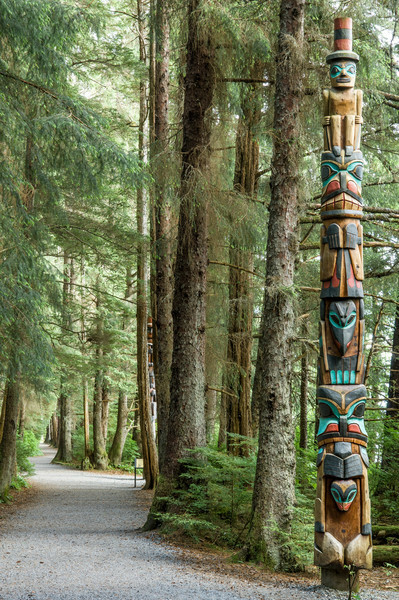 According to the 1980 guidebook of the Sitka National Historical Park these "twin" poles illustrate that "The carver as an artist had little if any personal liberty in his work, his contribution being skill and dexterity and a knowledge of the traditional style. He was told exactly what was to be carved on the monument, and traditional style...dictated the style and manner in which the conventionalized figures would appear in the sculpture. Therefore. it is possible that different artists could have carved the two poles, producing pieces almost identical in appearance.